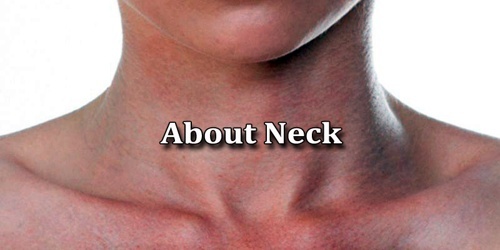 Neck is the part of an organism connecting the head with the rest of the body related adjectives cervical jugular. Also, any narrow or constricted part of a bone or organ that joins its parts as, for example, the neck of the femur bones. It contains blood vessels and nerves that supply structures in the head to the body. These in humans include part of the esophagus, the larynx, trachea, and thyroid gland, major blood vessels including the carotid arteries and jugular veins, and the first part of the spinal cord. Neck is also called by its Latin names, cervix or collum, although when used alone, in context, the word cervix more often refers to the uterine cervix, the neck of the uterus. Thus the adjective cervical may refer either to the neck (as in cervical vertebrae or cervical lymph nodes) or to the uterine cervix. Neck has the ability to support a great deal of weight too; the human head weighs nearly as much as the average bowling ball at around ten to twelve pounds respectively. The shape of the neck in humans is formed from the upper part of the vertebral column at the back, and a series of cartilage that surrounds the upper part of the respiratory tract. Around these sit soft tissues, including muscles, and between and around these sit the other structures mentioned above. It is the start of the spinal column and spinal cord. The spinal column contains about two dozen inter-connected, oddly shaped, bony segments, called vertebrae. The neck contains seven of these, known as the cervical vertebrae. They are the smallest and uppermost vertebrae in the body. 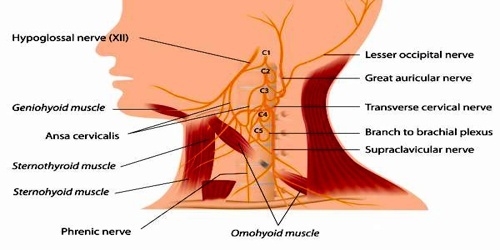 Neck has many muscles for support and structure. The muscles of the neck also provide the mechanism for swallowing, speaking, yawning, and moving the head around as well. With the weight that must be supported these muscles are strong and ready for duty. However, the muscles of the neck can be easily strained or injured. With seven cervical bones or vertebrae it has a great deal of ability for flexion, extension, and rotation. The bones that make up the neck are responsible for support and structure along with protection of the spinal cord as it exits the skull. In addition, the neck is highly flexible and allows the head to turn and flex in all directions. Injury to the neck or repetitive strain can damage the nerves of the neck as can major trauma. If the neck is injured during major trauma even the nerves of the diaphragm can be interrupted causing death. This is common in injury to the first and second cervical vertebrae. The word “neck” is sometimes used as a convenience to refer to the region behind the head in some snails, gastropod mollusks, even though there is no clear distinction between this area, the head area, and the rest of the body.